TOYOTA GAZOO Racing finished second in the 84th edition of Le Mans 24 Hours but had the victory taken from its grasp in a cruel late twist. Both TS050 HYBRIDs took turns to lead the race as part of an exciting battle with the #2 Porsche and was poised to win with the #5 crew of Anthony Davidson, Sébastien Buemi and Kazuki Nakajima before incredible late drama. Starting what would have been the penultimate lap, with Kazuki at the wheel, the #5 suffered a sudden loss of power. Despite strenuous efforts to restore drive, the car struggled round the lap and stopped on the start-finish line. It was eventually restarted and completed the final lap too slowly to be classified. The #6 of Stéphane Sarrazin, Mike Conway and Kamui Kobayashi, a long-time leader of the race which suffered its own troubles late in the race, finished second, behind the winning #1 Porsche. That marked TOYOTA’s sixth podium finish, its fifth second place, in its 18th Le Mans since a debut entry in 1985. The race was one of the closest fights in Le Mans history, with three cars locked in an intense battle for the entire 24 hours. As a new car for 2016, the TS050 HYBRID, with its powerful 2.4litre turbo engine, 8MJ hybrid system and redesigned chassis, did not start the race as favourite but demonstrated its potential by setting the pace throughout. Better fuel efficiency from the TS050 HYBRID allowed it to complete 14 laps per stint, while its rivals pitted one lap earlier. That reduced the number of stops required and contributed to a fascinating battle for the win. Prior to the late drama, the TS050 HYBRID had suffered few issues. The #5 needed an additional pit stop early in the race due to severe tyre vibrations, while the #6 lost 30secs to repair minor bodywork damage following contact with a lapped car. After 20 hours of flat-out racing, the top three were covered by less than 30 seconds, but soon the #6 dropped out of the battle for second, spending nine minutes in the garage to repair bodywork. Nevertheless, it resumed in a comfortable third place. 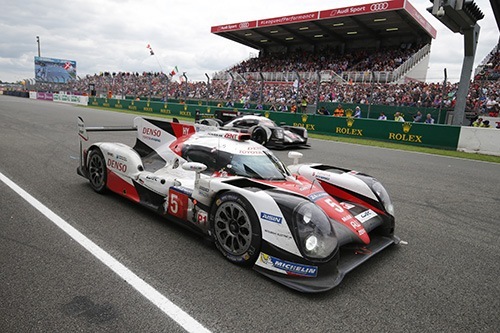 There was no respite for the team in a nervous finale as the #5 held off its rival until, with the race seemingly heading TOYOTA’s way, 260,000 stunned fans witnessed one of the most dramatic finales in the history of Le Mans. The team will analyse the cause of the problem as part of its preparations for the 2017 Le Mans 24 Hours, which begin immediately.